Hello May 1st! It Mother’s Day Month! And no better way to start off a new month than a little post just for my favorite lady, right? You see my mama around the blog often. She’s my sidekick on adventures, the gal who cooks dinner for my family almost once a week, the one who now has her own Tula to wear her grandchildren when we’re out and about. She’s one in a million, my best friend and the woman I aspire to become. 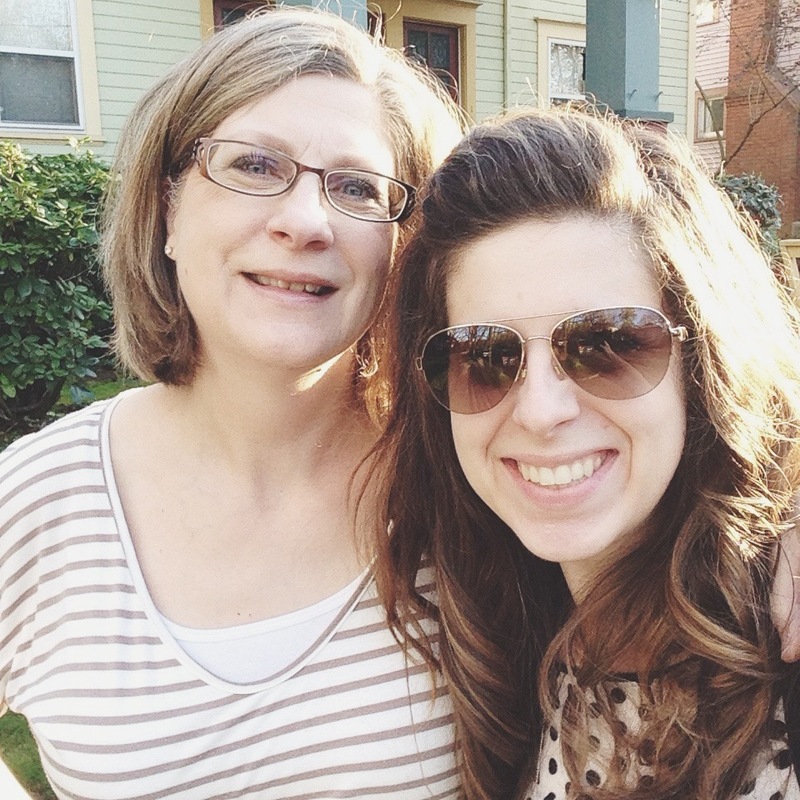 Every Mother’s Day, especially since becoming a mom myself, I get mega sappy about her. She’s just so … fabulous. From her chic, new “over 50” hairstyle to her excitement over finding an Instagram shop that is “just so cute!”. Her fabulousness doesn’t stop there. She reads nonfiction , journals, attends Bible study, has a counselor and a life coach. She is the most applied person I know. Nothing seems to through her step or her inner peace. Sometimes she’ll stop by my house after her day of teaching and I think, “Wow, if only I could look like her today! Her cute outfit, her genuine smile.” She rocks her StitchFix and Noonday and her face still looks fresh and full at the end of a day with 20 kindergarteners. I, on the other hand, am wearing elastic waist sweats and my wild hair is unsuccessfully tamed in what she affectionately recalls as a “banana clip” from her SAHM days in the 1980s. Oh, the seasons of motherhood. When she looks at me now, with two young kids shrieking about and cereal crunching under our feet while we visit, I know she seems part of herself. Not only because I’m her daughter, but because she was once me. Twenty five years ago she was at home with her littles ones. She has lived my days. She has said my same prayers. She has glanced in the mirror and whispered to herself, “Tomorrow, I’ll tease my hair, hairspray it high and tuck this banana clip in my bathroom drawer.” :) Even though she is in a different season of mothering now, I see it in her eyes – she can time travel at a moment’s notice. She has juggled as I have. She has slept few hours like me. She has carted children to doctor’s appointments and grocery shopping. She remembers. I’m guessing that’s why she often says all the right things to boost my spirit. People who have known my mom and I for years say we look alike. Even more, they say Jemma looks like her grandma. As flattering as it is to emulate someone so wonderful physically, I hope more and more people begin to see her IN me. I want her peace and patience; her draw to care for others. More than anything though, I want to be like her on the inside. She’s kind and brave; persistent and faithful. If you ask her, she’ll rattle off her faults, her misfortunes, but all I see is how she turns those things into good, into learning lessons. Today’s post was sponsored by Palm Beach Tan and with their sponsorship they are offering a wonderful giveaway! 5 lucky followers will be randomly selected for their choice of a free spray tan or sunbed session, and one grand-prize winner will win a three-month Diamond Premier membership for both themselves and their mom (both sunless and sunbed options available with Diamond level). Winners must be over 18 yrs of age, and the offer is valid at any Palm Beach Tan Salon near you. To enter the giveaway, leave a comment sharing a special beauty or character trait that you inherited from your mama by Sunday, May 10, 2015. Palm Beach Tan is responsible for selecting, notifying and fulfilling the giveaway so keep your eye out for them after the giveaway ends! Also, in honor of Mother’s Day, Palm Beach Tan salons across the nation are offering FREE sunless or sunbed sessions with the purchase of a $25 gift card. Offer valid until May 10. Visit palmbeachtan.com for more information or check them out on Facebook, Twitter and Instagram. Oh girl. Big, wet tears over here… your mama is the bomb! And super cute. And you can the awesome ooooooooze out of her into the lives she loves. Give her a bonus hug from me too this Mother’s Day! What a beautiful tribute to a very beautiful woman! From my mama, I got my big, blue eyes! That’s no joke. Also, you’re gonna make me bawl thinking about Momma K – she is all this and more! LOVE YOU BOTH! Great idea for a post! It gets harder each year for me without my mom. She left us when I was 18, I am 35. I would love to just have mom over for coffee and let the kids crawl all over her…she would of loved that. As the years go by I forget little things about her but I can never forget her beauty. She was truly gorgeous inside and out. A Marilyn of the 80’s we called her ;) HA! My love of leggings came from my mama ;) Happy Mothers Day to all the gorgeous mamas out there.